Tens of millions, even those with health insurance, still struggle with unpayable medical bills due to rising deductibles and co-pays and skyrocketing prescription drug costs and hospital charges. Insurance networks sharply restrict patient choice. Millions remain without any health coverage, or simply avoid getting the care they need because they can't afford it -- at great risk to their health. Disparities based on race, gender, age, or where you live remain rampant. One widely-promoted theme is to replace the tax subsidies the ACA provides to buy private insurance on the ACA exchanges with tax credits or health savings accounts to buy insurance on the open market. But those offer consumers even less protection from skyrocketing premiums or being forced to settle for bare bones junk insurance plans with limited benefits and higher out of pocket costs. Then there's the Paul Ryan plan to privatize Medicare -- a sure-fire way to impoverish millions of seniors forced to fend for themselves on the inefficient, more expensive private market. The rightwing policy wonks label these approaches "consumer-driven free market health solutions." If the well funded, "grassroots" campaign in response is led by the Beltway Foundations and NGO's to only defend the troubled ACA, then, yes, that's precisely what will happen. But the "free market" is exactly what created the healthcare crisis in the U.S. in the first place, creating a health care system largely based on ability to pay that ranked first in the world in spending and far behind most industrial nations in access, out-of-pocket costs and a variety of quality benchmarks. 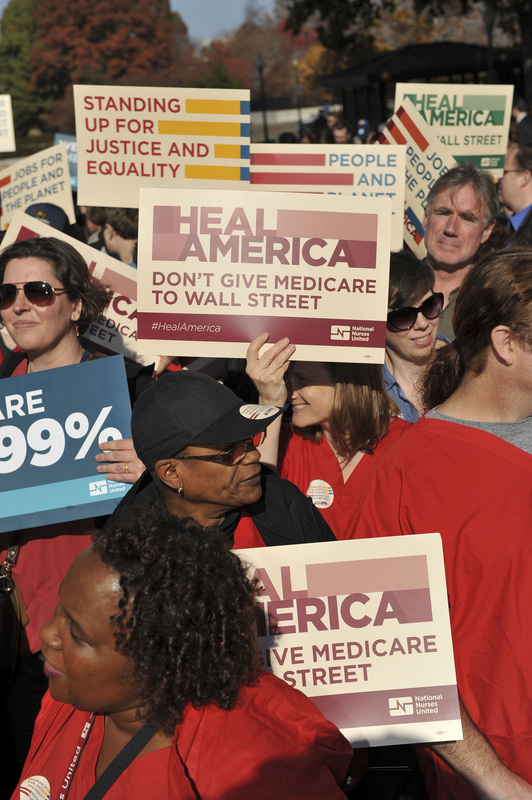 Instead, let's build the demand to protect, improve and expand Medicare. It's the standard by which any healthcare system should be measured. If the Trump administration and the Republican-controlled Congress want to define what the healthcare system should be, let's start with a truly patient-based approach. Nurses' credo for transforming the U.S. healthcare system is to establish a single standard of safe, therapeutic care for all, based on the clinical judgment of doctors, nurses, and other providers. •	Complete choice of doctor. •	Demonstrated low overhead - Medicare is well known for administrative costs of just 3 percent compared to far higher figures for private insurers due to profits and paperwork. •	Popular, fair healthcare program supported by nurses, doctors, and a majority of Americans! Improved Medicare for All checks all the boxes. If Ryan really believes repealing the ACA will "leave no one worse off," the only way to achieve that is Medicare for all. 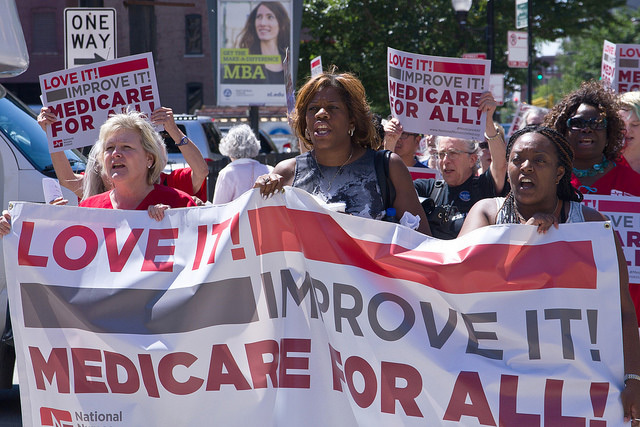 California, with Democrats in control of the governor's office and state legislature, is one state that can set a national model of how to do reform right by adopting a Medicare for all type system. Medicare remains one of the most popular social reforms in U.S. history. Expanding it to cover everyone is an idea favored by 58 percent of Americans, as a May Gallup poll demonstrated. It's the real healthcare reform we need.